As long as you can get over the high price tag and cope with the slightly awkward body shape, you'll be rewarded with superb images, great anti-shake performance and a lens that's simply out of this world. The L1 probably won't sell by the ton but this is a statement of intent by Panasonic. We're already looking forward to follow-up. To some, Panasonic's first-ever D-SLR might appear as though it's been cobbled together from the entrails of an Olympus E-330... but it would be wrong to draw such a conclusion. 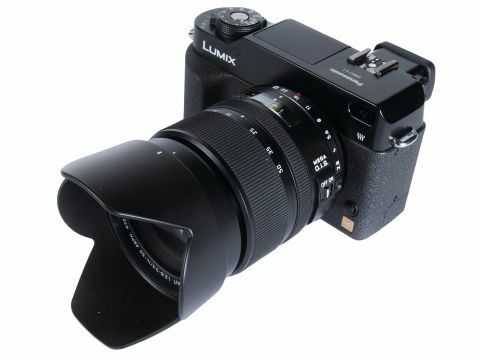 It's true that the L1's mirror box, shutter and viewfinder hail from an Olympus factory, but the 7.5Mp NMOS sensor and the new firmware at the heart of this intriguing camera are one hundred per cent pure Panasonic. And what a great sensor it is. This is the same CCD that graces the E-330, and for the simple reason that Panasonic makes the chip for Olympus. It's an NMOS device that can feed a live image to the bright and colourful LCD screen at the rear of this unusual camera. And now that we've managed to scotch the rumours that this is simply a rebadged Olympus, we can move on to examine the Lumix L1 in closer detail. Let's start with the camera body. This is a boxy and rectangular metal design that harks back to Leica's range of M-series 35mm film cameras. In ergonomic terms it's hardly a triumph of modernity and usability, mainly due to the shallow height that causes the user's bottom two fingers to struggle to find a resting place on the slightly cheap feeling, textured plastic grip. The underlying magnesium alloy shell is extremely well made and almost feels as if it's been hand crafted. There's definitely a whiff of Leica about the construction, although it does have a slightly odd feeling in the hand and you do have to spend some time with it in order to feel more comfortable . If you're used to shooting with a more conventional SLR body then you may not like the L1's elongated frame and slightly quirky controls. The L1 stores its images on an SD card rather than the dual xD and Compact Flash slots provided on its Olympian cousin. The memory card compartment door is well made with a hefty spring-loaded flap that should withstand plenty of openings and closings. Panasonic has opted to use SD cards because it was the co-inventor of the format. And as you'd expect from a founding member of the SD club, Panasonic has made sure that the L1 is compatible with the new high-capacity SDHC cards. Companies such as Pretec and Toshiba have announced new SDHC cards with capacities of up to 8Gb. In common with the Olympus E-330, the L1 incorporates a Live View feature that takes a real-time image from the sensor and then feeds it through to the crisp 2.5-inch LCD screen. Sadly, we think that Panasonic has missed a trick here by not fitting the same tilting screen that Olympus has incorporated into the E-330. The lack of a tilt mechanism makes taking of low-angle shots a right pain in the neck, and it does seem an odd thing to have overlooked or deliberately omitted. That said, the Live View is excellent and, when used with the superb manual focus ring on the 14- 50mm Leica kit lens, is perfect for taking closeups and checking out lighting situations. Incidentally, that NMOS CCD sensor also features a Supersonic Wave filter for reducing the effects of sensor dust. Over time, dust and specks can settle on the light-sensitive sensor and that can cause dust patterns and dark spots to appear on images. Cleaning such a delicate component is not something for the fainthearted and clumsy cleaning can even wreck a sensor. The L1 keeps down dust levels by shaking the sensor's glass filter with a wave of high-frequency vibrations that cause dust spots to fall from the sensor. The particles are then trapped on a piece of sticky material in the base of the mirror box. For those photographers who are used to using older-style film SLRs with separate shutter speed dials and proper aperture rings, the L1 will feel like a breath of fresh air. The camera has both types of control and it's so much fun to be able to select apertures and shutter speeds in the old-fashioned way. It puts you right back in the creative driving seat and is a trip down memory lane for those of us who honed our photographic skills back in the 1970s and 1980s. Of course, if you simply want to shoot on full automatic mode then it's really easy to dial in the Auto setting and shoot away. In terms of exposure and white balance settings the L1 is hard to beat. Even under the most hideous of mixed lighting conditions - with fluorescent, tungsten and even a dash of daylight fighting for space - the L1 coped magnificently. Whites were white and exposures were bang on. Perhaps our only gripe was with the lever that's used to select the metering mode. Unfortunately it's far too close to the shutter speed dial and it's all too easy to accidentally move the lever and end up shooting in Spot mode rather than Multi or Average mode. The Panasonic's menu system for changing various settings such as image size or Film Modes is really easy to use and a lot simpler than the offering on the Olympus E-330. The white text on black background is easy to see under most conditions and each Menu setting can be selected by using a small thumb-operated jog wheel on the back of the camera. By the way, that thumb-wheel is a bit awkward to operate and it did feel as though it is in the wrong place. We found ourselves continually missing the dial with our thumb when looking through the viewfinder. And speaking of viewfinders, the L1's example is a little cramped and rather dark. This is down to the fact that the camera uses the same Olympus side-mounted porro-finder system of the E-330, a tortuous optical path that bends the light through five turns using a system of mirrors and prisms. Frankly it's miracle that any light reaches the viewfinder at all. And unlike the E-330, there is no secondary sensor in the viewfinder to feed a live image through to the screen while the mirror is down. It's not a big loss but it does slow down picture taking because the mirror needs to momentarily drop back into position when working in Live Mode before a shot can be taken. If you're trying to capture the fleeting visit of an insect on a flower, you could find yourself frustrated. A camera of this calibre will probably be used with a dedicated external flash when taking internal shots. Panasonic has opted to stick with the same system as Olympus so that a high-powered FL-50 flash will work with full auto metering for excellent results under most conditions. However, at almost £300 the FL-50 is a bit pricey so it's good to know that the L1 has a small built-in flash. Not only can this pop-up wonder provide a good level of illumination for most subjects under 6m away, but there's also a nifty little bounce feature that enables you to direct the small flash upwards to avoid the harsh lighting of direct flash. It's a neat little trick that's well worth experimenting with. The last major feature worth a major mention here is the superb Leica kit lens with its built-in image stabiliser. Panasonic has always used optical image stabilisation (Mega OIS) as opposed to a moving CCD mechanism. This optical route does mean that the lenses for the L1 will always be more expensive because they will have to incorporate an antishake feature. Of course, if you choose to use another 4/3 lens, such as those produced by Olympus or Sigma, then you'll have to forego the anti-shake feature. The 14-50mm Leica kit lens offers an extremely useful 28-100mm zoom range and the images it produces are colourful, sharp and extremely pleasing with good bokeh when used at the maximum aperture of f2.8. At the telephoto end of the range the aperture is smaller at f3.5, which is still very creditable for this type of zoom. The OIS antishake feature is activated by a side-mounted switch and offers up to three extra stops of exposure, which makes the L1 handy in lowlight situations. The lens is also unusual in being able to focus far closer than most of the other SLR kit lenses. Its razor-sharp optics and almost total lack of distortion are compelling reasons alone to consider this camera. Let's hope Panasonic decides to offer the lens for sale on its own so Olympus owners can get their hands on one too. All in all the L1 is something of an oddity: it's expensive, slightly awkward to hold, but in no way is it a 'me too' D-SLR. And once you've managed to get used to the strange handling, picture taking becomes really enjoyable. The image quality from the Panasonic sensor is very good indeed. Noise levels are low and the colours are simply stunning. Some users may find the saturation a little on the high side, but the selectable Film Modes enable you to construct your own picture parameters with just the correct amount of sharpening, saturation and contrast that you want. We found the standard setting to be perfect for delivering vibrant reds, luscious greens, and all without any discernable colour cast.